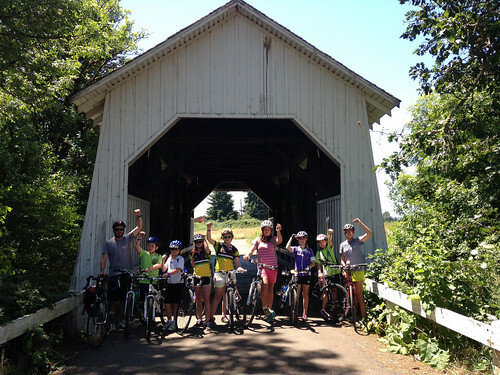 Steinbeck once wrote, “You don’t take a trip; a trip takes you.” So appropriate is this quote for my first foray into the world of Cycle Oregon Weekend Ride, the premier weekend bicycling adventure. 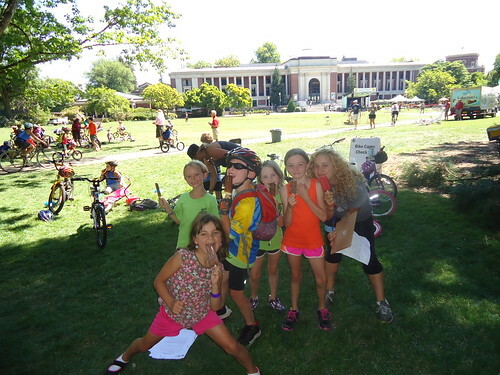 As the new Development Manager for the Community Cycling Center, I was invited to partake in the Cycle Oregon Weekend Bike Camp. Not knowing what to expect, I just let the trip take me. Leaving Portland and heading to Oregon State University (OSU), I and two other instructors arrived 4.5 hours later thanks to the weekend traffic. Luckily, we were comfortable in our car generously donated by Zipcar and didn’t fret something like traffic. However, upon our arrival, we soon learned that dinner had concluded. For three exhausted and hungry people, that did not seem like a great start to a weekend. Fortunately for us, the instructors that arrived before us had secured some deliciously prepared food from the OSU catering department. They became our new best friends. Full of food and fatigued, we made our way to camp for an early night. However, our deep sleep abruptly ended at 1:30am. Roused by a twisting and pumping feeling under my sleeping pad, I quickly surmised that a sprinkler was trying to make its way into my tent. Jumping from my tent to find the rest of the Bike Camp instructors awake and wet, I felt a camaraderie that only comes from shared experiences. Each of us helping to move tents and camping gear out of the sprinklers’ warpath, I knew right then that this is what Bike Camp (and all of the Community Cycling Center’s programs) is all about: connecting to your fellow community members. 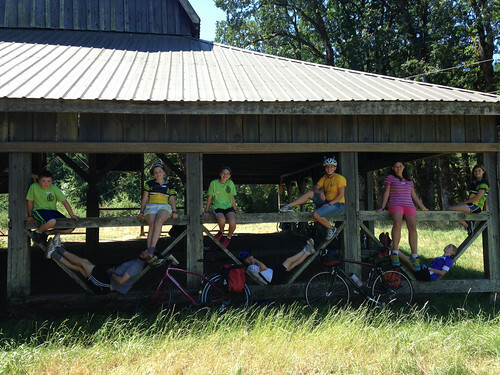 The rest of the weekend was a series of shared experiences by all participants, but especially Bike Campers. Tired, smiling kids came back each day happy and empowered from their long day of riding, playing games, running through fountains, and making new friends. 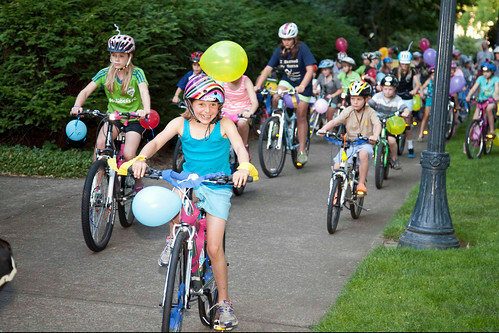 One 8-year old girl shared with the audience at OSU that she set a new personal record for distance – 11 miles, while another camper explained that she was excited to celebrate her 13th birthday at Cycle Oregon Bike Camp. Sprinklers and near infinite traffic are what brought me closer to my co-workers, those that, like me, want to help broaden access to bicycling and its benefits and provide a weekend full of bike fun for the kids. 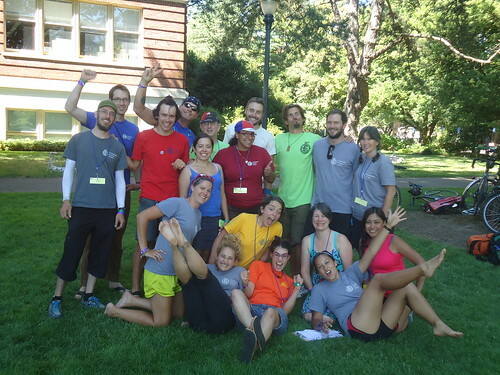 I want to thank all the folks at Cycle Oregon for their tremendous work for putting together one of the best bicycling experiences I have ever participated in. 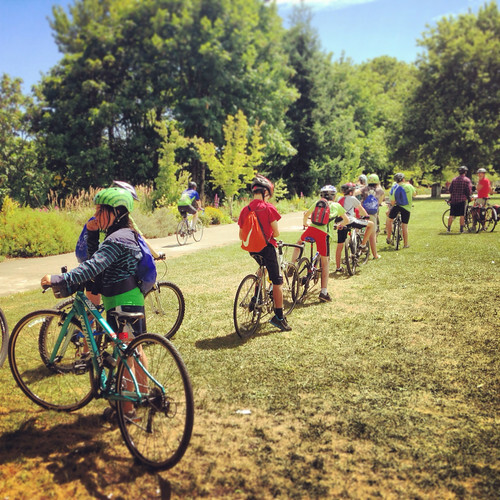 I want to also thank all the Bike Camp instructors for their amazing work and dedication to Community Cycling Center, and to all the kids at Bike Camp for sharing one of the most memorable weekends I have had in a long time.